One of the most prolific singers of the South Indian film industry rising as a sensation in Hindi cinema will be the star attraction at a music concert in Auckland next month. 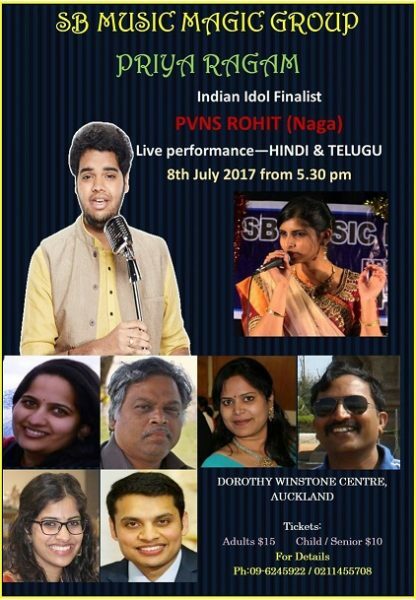 PVNS Rohit (Rohit Paritala, also known as Naga), who battled hard to get to the Finals of India’s Idol 2017 (Ninth Edition) less than three months ago, will perform at the annual programme of the SB (Sangeetha Bharathi) Music Magic Group on Saturday, July 8, 2017 at Dorothy Winstone Centre, Auckland Girls Grammar School. The Programme, which will commence at 530 pm will have several local artistes including Vishnu Priya Mallela, Ravi Muthumanikkam, Sreesutha Nampally, Praveen Ravela, Archana Ravi, NP Srinivas Rao and Prathyusha Vikrant. (Octopad), Joscel Alexander (Acoustic Drums), Navneel Prasad (Tabla) and Balu Mallela (Mridangam). Rohit’s wide repertoire, well matched by our singers and instrumentalists, will enable the Concert to transit between Telugu, Tamil and Hindi film music. As a son of the Telugu soil (Hyderabad, Telangana), it was natural for Rohit to consider legendary singer S P Balasubrahmanyam (known as the ‘Living Robot’ with more than 50,000 songs in at least 21 languages to his credit) as his Idol. “Singing is my passion and I hope to achieve my goal and become a singer like SP. Otherwise, there would no meaning for my life,” the 25-years-old singer said. Commencing his career in music when he was five years old, Rohit received formal training and proficiency in Classical Music, which helped him at the India’s Idol auditions, knockout, quarter-finals, semifinals and final rounds. The Idol Season and episodes brought him to the attention of famous music personalities including SP, Anu Mallik and Sonu Nigam, the last of who became his mentor to guide him through the competition. Even before India’s Idol 9 Contest, Rohit had established his prowess as a performer in ‘Padutha Theeyaga,’ a popular reality show conducted by SP on ETV Channel. His singing style, good execution of various Ragas and ability to switch between high and low notes quickly made him a singing sensation with a huge fan following on Facebook and YouTube. His active participation in the Social Media keeps him in touch with friends and fans across the world. Rohit has a unique desire that he wants to sing in every single native language of India. He has well and truly discovered and established himself as a force to reckon with from the stage of Indian Idol. He was one of the two runners up in the show and has been touring all around the world since then, with performances in Dubai and all over the United states with several singers of fame including KS Chitra.